With an estimated 75 million Americans checking their social networks several times each day, it’s vital that brands incorporate social into their strategies. Being active on social media allows for a more direct and personal conversation between the brand and customer. When used correctly, its influence and reach is extremely powerful. Below are some of the top brands that are winning at social media. 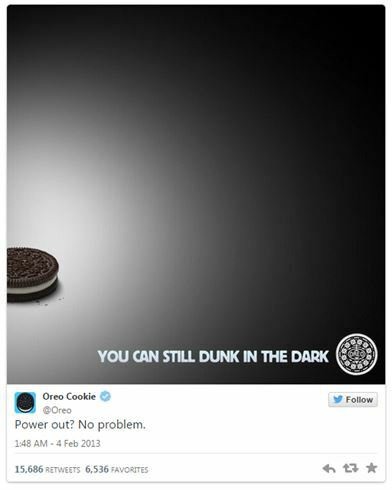 Knowing exactly how and when to target their audience is Oreo. A brand that is more than capable of taking advantage of certain events and issues. Their social media team are witty and quick-thinking. One of their punchy visuals was created during the infamous Superbowl XLVII blackout, which led to more than 15,000 retweets and over 20,000 likes on Facebook, whilst the total campaign had 280 million media impressions. Yet arguably the most impressive outcome was that Oreo earned more publicity than brands that paid for an advert during the big event. Their tweet was short and sweet and is working proof of two business clichés: “a picture tells a thousand words” and “timing is everything”. Whilst their stunt proved to be extremely popular, it’s more impressive to point out that this was not a one-off. Oreo’s Daily Twist campaign featured one image every day for the brand’s centennial month, and also performed very well. Another common approach that brands have used to engage with their target audience is to inform and educate. 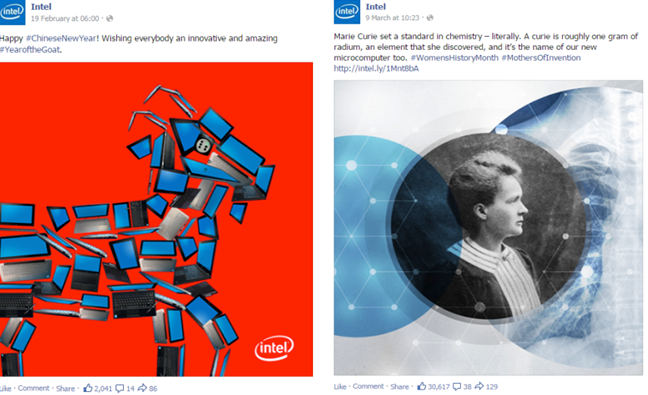 Intel, for example, often share updates about events they are hosting or attending, but even more so, facts and general knowledge that would interest their readers. Not only does this create useful content their readers will find entertaining and useful, but also helps associate Intel with intelligence and knowledge. By looking beyond the purpose to promote their brand alone, they have strengthened their position as authoritative voices in the silicon innovation and technology industry (an accolade they held long before social media existed). 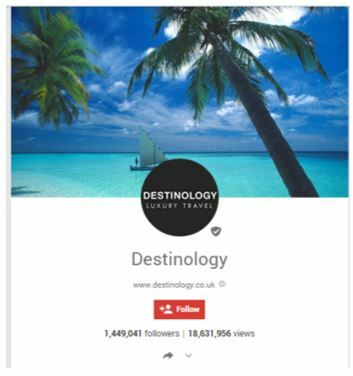 Focusing on the luxury travel niche is Destinology, the luxury travel provider who command an impressive following of more than 1.3 million people on Google+. Lindsay, who works with Destinology, says that the company’s focus is to tell a story through their social media pages by using stunning visuals that will show readers the true experience of their holidays. Understanding the behaviour of people online is vital for the success of Destinology. “People love to ‘like’, comment and share images that are striking and inspiring,” said Lindsay, who recognises how effective the use of imagery and capturing the imagination is. Further developing their user experience, Destinology have also introduced virtual tours of the hotels they offer. Working with Google Maps, their virtual tour allows potential customers to virtually explore hotels before booking, ensuring that the rooms and facilities meet set requirements. Tangentially continuing the travel theme is the entertaining conversation between Morton’s Steakhouse and Peter Shankman, the American entrepreneur, who has over 166K Twitter followers. As Shankman was boarding a flight, he jokingly sent a tweet to the steakhouse asking if they could deliver a steak to the arrivals lounge. Morton’s took advantage of the public request and decided to do exactly what Shankman had asked for, arranging a tuxedo-clad man to deliver the windfall of steak and sides. With the nearest Morton’s being 23.5 miles away from the Newark airport, this meant that in under three hours their press team saw the tweet, received authorization to complete the PR stunt, placed the order and delivered the food. In addition to that, they had to find out which flight Shankman was on and which arrivals gate he’d be walking out of. Timing is important. It’s not always possible (or prudent) to share to social media without planning and approval, but sometimes it can yield fantastic results if done effectively and efficiently. Images are important. People behave in a very visual way on social media, and images are guaranteed to capture the attention of the viewer and result in shares, likes or +1’s. Knowledge is important. Positioning your brand as an influential and knowledgeable entity is difficult but, when achieved, hugely beneficial. Experience is important. Nowadays, everyone has a voice online. Brands are no longer expected to broadcast and promote how amazing they are, but to curate experiences instead. The brands reputation and brilliance will come naturally through word of mouth and customer loyalty.